It is that time of year again! Hundreds of school level bees occurred throughout the state from November to January, with a winner being crowned at each school. 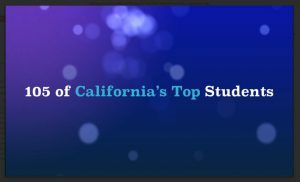 Now the top 105 school winners have been selected by the National Geographic Society and invited to take their talents to Fresno to see if they can emerge on top of a very intense competition. The competition will begin at 8 am on Friday, April 1 at the Satellite Student Union on the Fresno State campus. Once the preliminary rounds have been completed, the general public is welcome to come and watch the final and championship rounds, which will begin around 11 am. Good luck to all 105 competitors and congratulations to the thousands of students who participated in bees held at their school sites. Join our BioBlitz partners at the King Gillette Ranch for this FREE workshop to investigate biodiversity in the Santa Monica Mountains and life’s enabling substance, water. By blending EEI and Project WET activities together the workshop will illustrate the three dimensional learning cycle that is integral to the Next Generation Science Standards. Educators get research-based planning tools that, when implemented with integrity, will bring immediate benefits to students. Ample time for collegial co-planning is built into the workshop as we explore biodiversity in the parks. This workshop is designed to support teachers planning to visit a National Park area with their class or participate in Bio-Blitzes in the park or at their own school sites – but all are invited to attend this training and get outside with us! The CGA’s goal of creating a geographically competent workforce depends on increasing the quality of geography education in K-12 and making sure students see geography as a viable college major and career field. 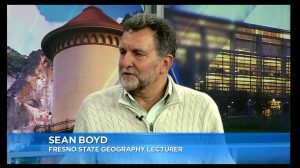 Professor Zia Salim at CSU Fullerton is helping to build the bridge between high school and college-level geography. Dr. Salim (far right of the photo) and the CSUF Geography Department hosted 100 students from La Habra High School on Dec. 4, 2015 as part of an outreach program to Advanced Placement Human Geography classes. 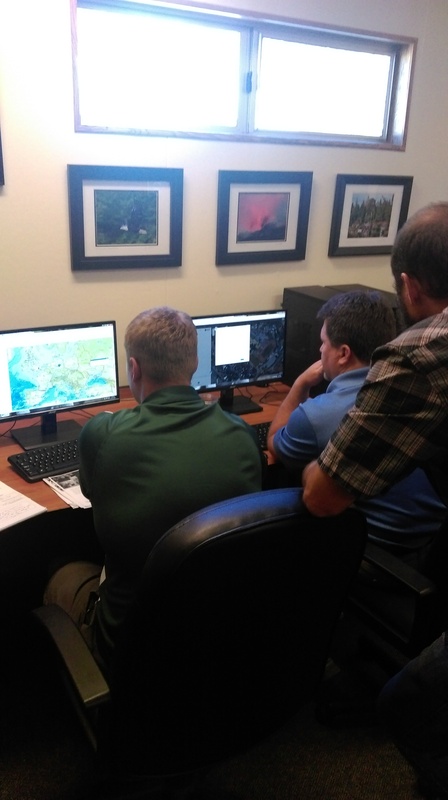 The program included an exercise utilizing geographic information systems and presentations on a variety of geographic topics. AP Human Geography is the fastest growing AP course nationwide, and we are excited to see high school students being exposed to what is happening at the university level so that they can give full consideration to geography as a field of study. Creating links between geographers at the college and university level and geography and social studies teachers in their local area is one strategy that the CGA is looking to expand. If you are a geographer that would like to connect with K-12 teachers and students, or a K-12 teacher looking to make a connection to a college or university in your area, please let us know! 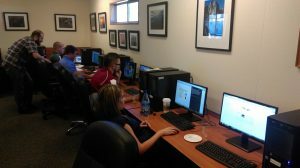 On October 16, 2015, the CGA provided a workshop on using ArcGIS Online to a group of 18 enthusiastic high school educators who teach science, social science, journalism, and career technical education courses at Placer UHSD. Gregg Ramseth, the district’s director of technology and assessment, has led the way in utilizing the free AGO Organizational accounts made available by Esri as part of the President’s ConnectEd Initiative, and a number of the teachers in the district are stepping up and engaging in the technology. Placer Union High School District teachers utilize ArcGIS Online during professional development workshop on Oct. 16, 2015. Teachers Robin Herrnberger and Greg Sloan participated in the first workshop held at Placer UHSD in the Spring, and then they attended the GeoTech Center summer workshop held at San Diego State University. They are now eyeing the possibility of attending Esri’s T3G Institute in the Summer of 2016! Greg will begin acting as an instructional coach for the district in January, which will further assist the district in supporting the inquiry-based learning promoted in the C3 Framework, engaging students in the kinds of practices called for in the Next Generation Science Standards, and building 21st century job skills. Greg and Robin are demonstrating how teachers can ramp up their own skills in order to utilize the GIS software to its fullest educational potential, but at the workshop we also emphasized that teachers can make good use of ArcGIS Online with minimal training on their part. 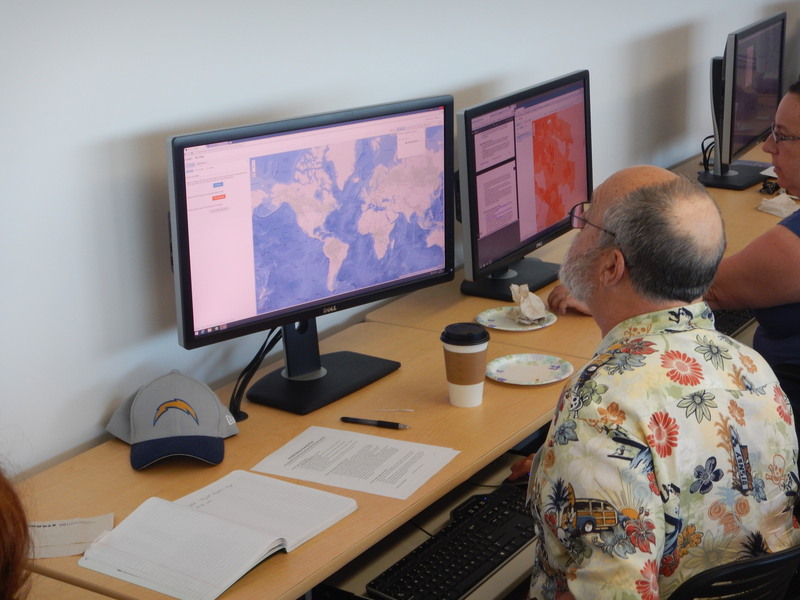 Teachers explored the standards-based GeoInquiries that Esri has created for teachers of earth science and history, and they also found that they could create their very own simple map within a matter of minutes. The CGA looks forward to continuing to support the Placer Union High School District. 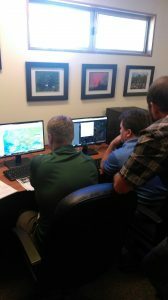 Other districts interested in taking advantage of the free, industry-standard GIS software now available to K-12 schools should visit http://edcommunity.esri.com/ and reach out to the California Geographic Alliance to schedule a teacher professional development workshop. 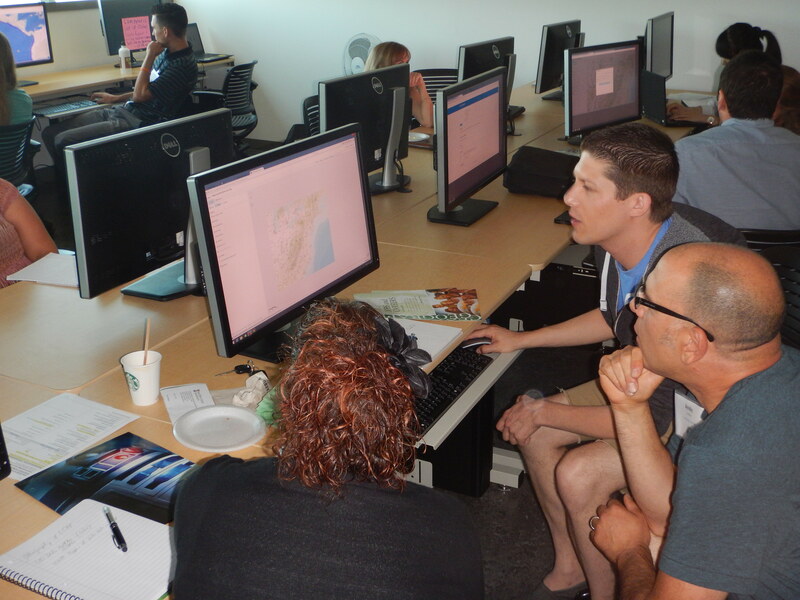 Teachers discover opportunities for data visualization and effective communication presented by ArcGIS Online. On Friday, March 27, the top 110 qualifiers from among all winners of school-level geography bees will convene in Fresno to compete for the state geography bee championship. The event will take place on the campus of CSU Fresno and will be hosted by State Bee Coordinator Sean Boyd. If you know of any other local media reports about school bees or state bee competitors, please send links to cga@geography.sdsu.edu. Greetings from the Alliance Network Annual Meeting at National Geographic Society headquarters in Washington, DC. We are hearing about changes in the way in which the Alliance network is organized and supported, and in the coming months there will be news to share about new initiatives and new activities, and we think there will be some things you can get excited about and use to get students engaged in learning. More on that to come, but for now we want to share something that is a little bit outside the box of our usual Alliance work, but still very related. Many of you may not know that the CGA team at San Diego State – in particular Stuart Aitken, Thomas Herman, and Kate Swanson – are also involved in conducting geographic research on the geographies of children, youth, and families. The concept of “geographies of children and youth” may be new to you, but because most of you work with children and youth on a daily basis, you will find it a familiar topic. It is an interdisciplinary field including education, environmental design, and sociology researchers who share an interest in places and spatial relationships. They examine the ways in which adults make space for children, youth, and families (playgrounds and suburban neighborhood design are simple examples). They are also interested in ways in which children and youth interact with and modify their environments (think about the old Family Circle cartoon that shows how the child who says she came straight home from school actually took a circuitous route throughout the entire neighborhood or the way kids tend to gravitate to forts and treehouses away from adults’ spaces). This field has grown significantly over the past 20 years, as is reflected in academic journals and in the number of disciplines who are using geographic thinking to examine the lives and well-being of children, youth and families. In January, we hosted the 4th International Conference on the Geographies of Children, Youth, and Families in San Diego. Over 160 researchers from 32 countries attended the conference, and they presented a wide range of ideas and evidence about what is happening in the lives of children and young people. If you are interested in learning more about the conference, you can check out the conference web site at: http://icgcsandiego.wix.com/ypbw or the ISYS Center web site at http://geography.sdsu.edu/Research/Projects/ISYS/. One big takeaway message for us as Alliance leaders and for all geography educators is this: Valuing the perspectives, concerns, experiences and voices of youth with regard to issues such as life in their community, what it means to be a Californian or an American, and how do we conserve our global environment will create incredible motivation for students to accumulate geographic knowledge and activate geographic thinking. You already know that, probably, but it is helpful to have an occasional reminder and some encouragement. We have lots of things to teach, some grounded in standards and some grounded in personal values, but we would encourage you to make sure that on a regular basis you are giving students an opportunity to exercise their voices, analyze their environments from their own perspectives and the perspectives of others, and express their ideas for a brighter future. An example of this came from a plenary speaker at the conference. Professor Katharyne Mitchell from the University of Washington gave a talk entitled “Counter-mapping with Children.” She taught students about the fact that maps reflect one view on a place, and that they reflect power relations and, often, official designations. They leave out some features and labels to make room for others that the mapmaker thinks are important to show on the map. Maps can therefore exclude the perspectives of minority groups or of people who do not possess official power and status (i.e., children). Dr. Mitchell then worked with the children to examine the perspectives of specific groups in the Seattle area where she works. The students focused on the perspectives of women, Asian-Americans, and African Americans and produced alternative maps for the city that elevated those perspectives. 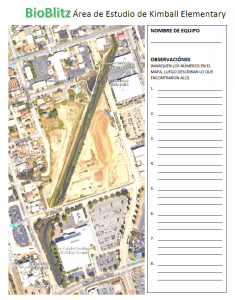 The activity built social and historic knowledge of the students while also engendering empathy and, wait for it…..geographic knowledge, skills, and ways of thinking! Sounds great, right? Only a shame she is not in California. However, immediately after the talk we had a chance to learn that Dr. Nancy Erbstein at the University of California-Davis is doing very similar work in California. A new collaboration is hopefully emerging from that conversation so we can share Dr. Erbstein’s work (and methods) with all of you. But you don’t need to wait. Have your students map their community. Have them look at maps of their home area and talk about what is shown on the map. Have them talk to others in the community about the places that are significant to them and check to see if they are shown on the maps you can access. Have them produce alternative maps that do reflect these features. It will be fun and relevant and it will build geographic knowledge and skills. It will hopefully also tap into their natural curiosity and lead to lifelong learning. 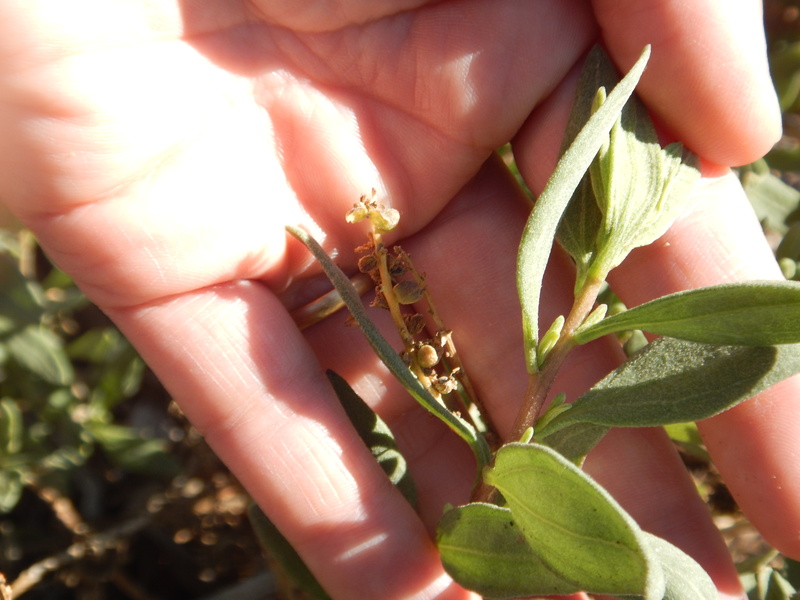 Programs and Projects of the CGA in 2015…and Beyond! Hello CGA members and friends. This month I wanted to provide a few updates to let you know what is happening within the CGA and what you can look forward to in the near future. But before I get into the news, I want to remind everyone reading this that the SDSU leadership team is really hoping to continue learning about all the things that are happening around the state and all the great people who are working to create opportunities for students of all ages to become geo-literate and to learn to love geography. Please feel free to get in touch with me directly at cga@geography.sdsu.edu if you have any questions, want to share something that is happening in your school or district, or just want to introduce yourself. 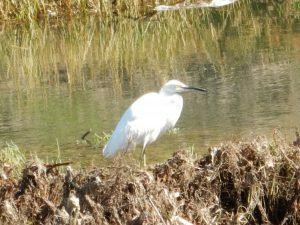 It would be great to get reports from “the field” that we could share in this newsletter, on our website, or on our Facebook page. The CGA will be well-represented at this year’s California Council for the Social Studies Conference in Oakland on March 6-8. We will have an exhibitor booth to distribute maps and other materials and introduce people to the educational resources on calgeography.sdsu.edu. If you are knowledgeable about the CGA and would like to volunteer some time at the booth, we can provide free registration for up to 3 Teacher Consultants/Teacher Leaders who will commit time to enthusiastically represent the CGA. Please contact me to express your interest. What Kind of Professional Development Do You Wish CGA Offered? The CGA has been focused on professional development supporting use of our awesome print atlas, California: Our Changing State. The atlas is a great resource, and the PD workshops have been wonderful, but this means we have been very focused on 4th grade teachers. We are thinking about ways to greatly expand our offerings across grade levels and subject areas, which leads me to pose a question to you all. If you could put one topic on our wish list for future PD workshops, what would it be? You can send your suggestions to me, or better yet, post them to our Facebook page so everyone can see your idea! Many of you will be aware of our efforts to move toward a next generation atlas that takes advantage of new technologies to incorporate expanded topical coverage, a high level of interactivity, and embedded content that helps teachers address standards and also meet the expectations of Common Core. This project gets us very excited, and our vision has been taking shape over months. It now has a new name: Geo-Quest: California’s Education Portal. The Geo-Quest project is an innovative approach to enhancing student understanding in the fields of history-social science, physical sciences, and other content areas at multiple scales. It is also a direct response to calls for greater civic responsibility and leadership development. As argued in the C3 Framework, “Now more than ever, students need the intellectual power to recognize societal problems; ask good questions and develop robust investigations into them; consider possible solutions and consequences; separate evidence-based claims from parochial opinions; and communicate and act upon what they learn” (NCSS, 2013, pg. 6). Geo-Quest will provide young people with the tools and scaffolding needed for in-depth learning and will foster critical thinking through independent and project-based investigations into important social and environmental issues. Providing students with these tools is crucial in order to help them become active, geo-literate, and knowledgeable citizens who succeed in college, career and civic life. As the world becomes more interconnected through globalization, geography education and geo-technologies can help students make sense of rapid global change. 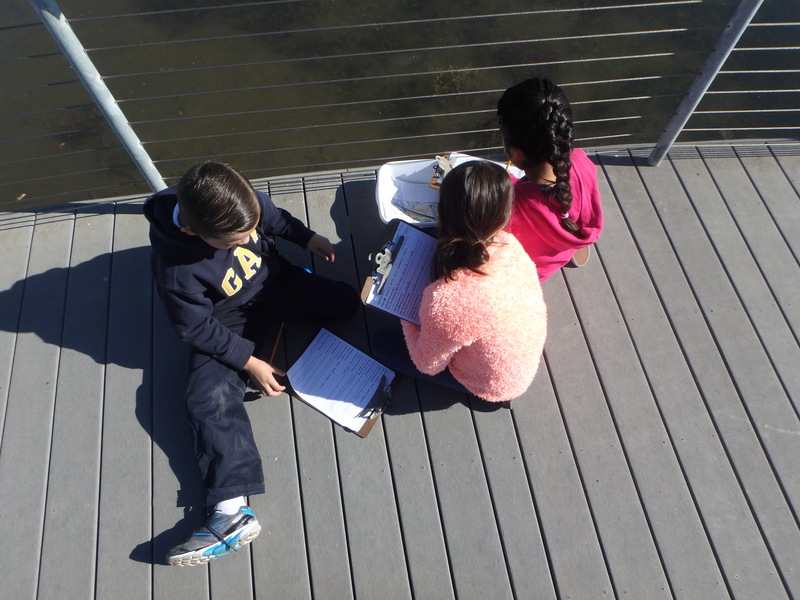 Understanding how spatial relationships link communities can help students appreciate intricate – and often unexpected – connections between themselves and distant places across the state, nation, and globe. This knowledge can foster more in-depth understanding on how people live – socially, culturally and environmentally. 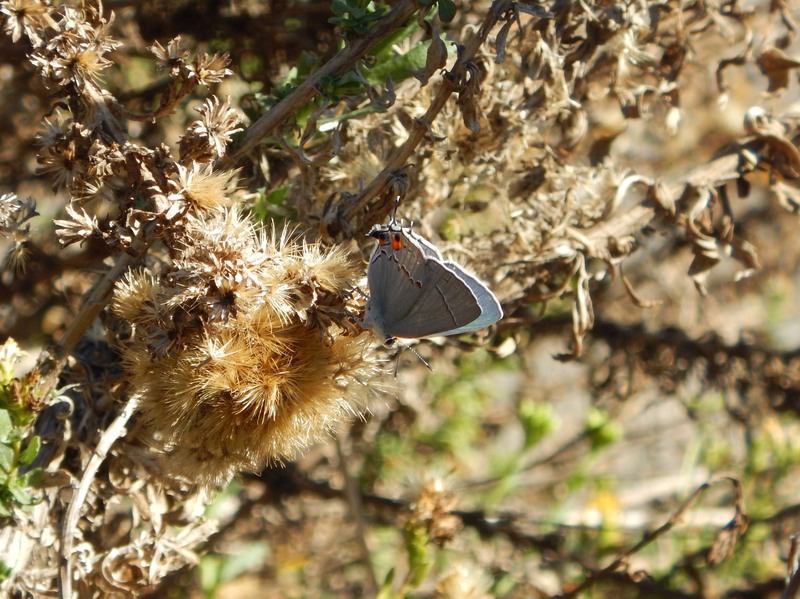 Ecological relationships are also critical to geographic education; understanding ecological interdependencies can help illuminate how human actions shape environmental change (c.f., Heffron and Downs, 2012). Using geo-technologies, we can map, record, analyze and communicate ecological and human population change over time. 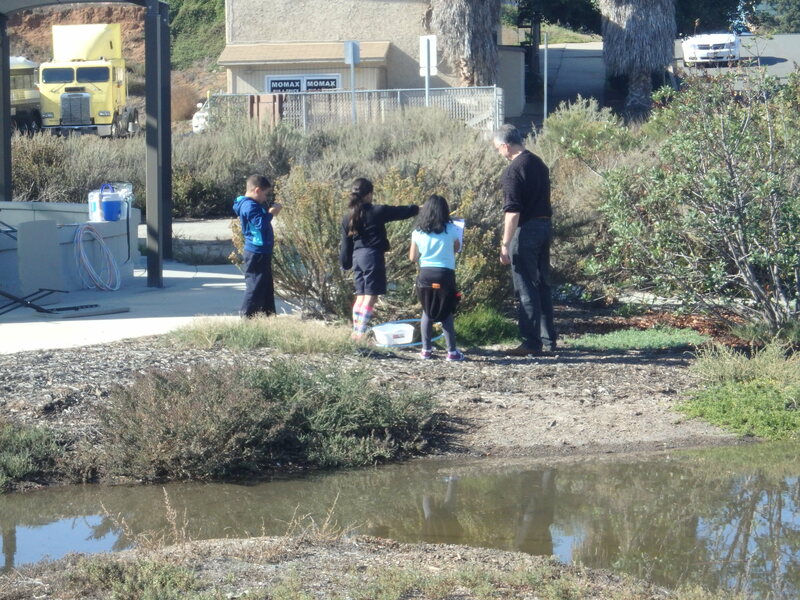 In states like California, where we are experiencing the worst drought in recorded history, visual and hands-on geo-technologies can help students comprehend the magnitude and impacts of this drought in a more profound way. Geo-Quest is important because it will help develop independent, critical thinkers who are technologically- and spatially-literate 21st century global citizens. Geo-Quest represents the aspirations of the CGA to become a hub for critical thinking and young people’s leadership as well as geography education. 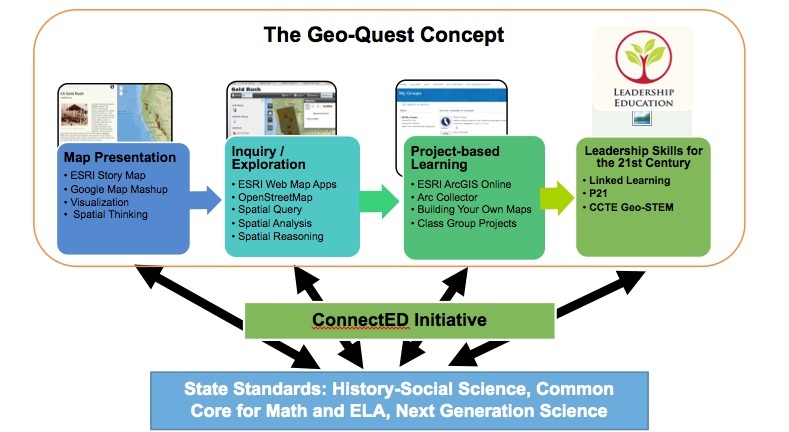 As a portal, Geo-Quest defines a space within which teachers and students across the state can build geographic knowledge and skills, encounter issues and data sources, and interject their own ideas and analyses. In addition to supporting students in making their schoolwork relate directly to the challenges of the world in which they live, we think this approach will encourage collaborations with other entities in California, including geography departments at our colleges and universities. You will be hearing more about Geo-Quest in the coming months and years. You will be able to watch it take shape on our website – even now, click on the Atlas 2.0 menu item to see some really cool things. CGA will provide professional development to assist teachers in using Geo-Quest in a variety of ways, and over time it will become a collaborative space where curated resources and user-friendly tools meet with the energy of educators, learners, storytellers, and problem-solvers.